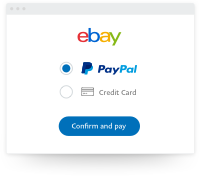 PayPal’s a safer way to pay on eBay. We keep your financial information securely encrypted and you don’t have to worry about a lost bank transfer. Own a business? 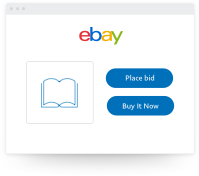 Sell on eBay with PayPal. Shopping on eBay is easier with PayPal. Sign up for a PayPal account and link it to your eBay account. 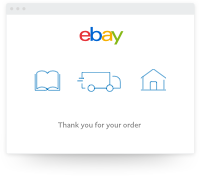 Pay for your eBay purchases faster using PayPal. Pay with confidence. Your financial details are protected. Why use PayPal on eBay? Millions of eBay sellers around the world prefer PayPal. They’re paid quickly and you pay safely. You can choose to stay logged in on the eBay app and you won’t even need to enter your PayPal details every time you buy. Shop with peace of mind. If an eligible item doesn’t arrive or arrives significantly differently to how the seller described it, we can help you get your money back and wrap things up with the seller. Buy from eBay sellers around the world. We accept 25 currencies from more than 200 markets. If you’re buying from an international seller, we can convert your money for you for a small fee. "I love the peace of mind when shopping on eBay – if something goes wrong, PayPal will reimburse me with no stress or hassle."